Where Did That Cemetery Go? 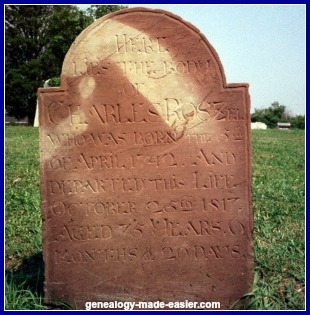 Finding abandoned cemeteries is important to you in your genealogy research. It often happens that our ancestors were buried in graveyards that have now been abandoned for any of many reasons. There are many such untended graveyards. It is worth your time and effort to do a graveyard search in the location where your ancestors lived to find such old cemeteries. Many of the first burials were in church burying grounds which are still carefully tended. In other cases, congregations dwindled and churches closed and the church cemetery was left to its own devices. Finding those graves' headstones can often be problematic. In yet other cases, these were local graveyards without religious affiliation. Old, small communities may have now disappeared, and the graves have become unattended. No one is responsible for the graveyard maintenance and the records. In some places these abandoned cemeteries have been sold for the land they occupied. Perhaps the cemetery monuments have been moved to one central location after the grave contents were moved elsewhere. In other cases, the grave headstones were simply removed along with the other debris of excavation for the new buildings. In that case, you are unlikely ever to find the markers. Sometimes you can locate where the abandoned cemetery is, but you find that it is on private property. Perhaps it is back in a farmer's fields, or in the edge of a woodland. In order to examine what remains of it, you need to get permission from the owner, and that is not always forthcoming. When your searching leads to such a cemetery, your search becomes much more difficult but certainly not impossible! Track down every lead you can find. Check old newspapers, libraries, town/city hall, court house, post office, churches, local people. Any or all of these resources might add information you need to determine your next move. You might also check the internet sites, both free and paid, to see if this is a cemetery where a local organization has been able to get permission to photograph what remains of the stones and signage in it, and those images are now available to you via your computer. More and more cemeteries, both abandoned and well-tended, are appearing on such sites.